February 20, 2018 -- Mayor Sylvester Turner congratulates the City’s emergency medical services director, Dr. David Persse, along with Houston Texans star J.J. Watt, Nobel Laureate Dr. Robert Lefkowitz, and ophthalmology professor Dr. Alice McPherson on their selection to receive honorary degrees from Baylor College of Medicine at commencement ceremonies May 29. Persse and Watt will be honored for their work on helping Houston recover from Hurricane Harvey. Lefkowitz, a cell receptor researcher, will be the college’s commencement speaker. McPherson is one of the foremost retina specialists in the world. 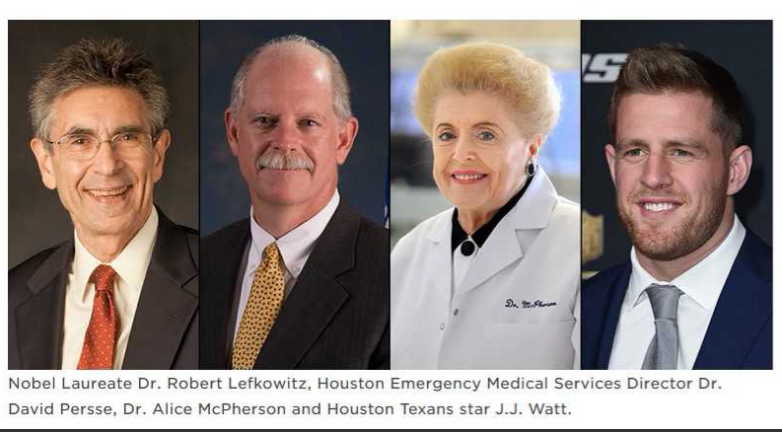 “In the year following the devastation of Hurricane Harvey and the community’s incredible response, it was most fitting to honor two community leaders who contributed in major ways, Dr. Persse and J.J. Watt. Our graduates and their families can take important lessons from all of these honorary degree recipients,” said Dr. Paul Klotman, president, CEO and executive dean of Baylor. Persse and Watt will receive a Doctor of Humanities in Medicine degrees, awarded to individuals who have provided exceptional support or service directly or indirectly to Baylor or to academic medicine as a whole and to the community at large. Persse, Houston’s public health authority and a professor of emergency medicine at Baylor, is responsible for the medical aspects of the City’s clinical care, quality management, disease control and public health preparedness. Baylor physicians worked closely with Persse to meet community medical needs after Harvey.